by Brianna Crandall — September 3, 2018 — Semtech Corporation, a supplier of high-performance analog and mixed-signal semiconductors and advanced algorithms around the world, recently announced a collaboration with HEX SAFETY, a Taiwan-based smart fire prevention company, to incorporate Semtech’s LoRa devices and wireless radio frequency technology (LoRa Technology) into its Dynamic Evacuation System. Emergency data transmission is extremely important in a fire scene, and Semtech’s LoRa Technology helps us to build a more stable solution. LoRa Technology not only brings a new vision of fire prevention to the industry, but also creates an innovative IoT application use case that better serves cities and communities. We hope to use this technology to make public space and large-scale buildings safer and more comfortable. HEX’s Dynamic Exit Signs integrated with LoRa Technology intuitively help people navigate complex hazardous zones in real time by indicating the quickest and safest direction out of the premises. The conventional exit signs only signal where the closest exit is, which may mistakenly lead people into hazard zones, points out the company. But the HEX Dynamic Evacuation System communicates with the building’s existing fire alarm system and sends the safest direction to every HEX exit sign in the building. By enhancing people’s decision-making and shortening the egress route, the HEX Dynamic Evacuation System can significantly increase the chance of survival. Since power outages are common during a fire, LoRa Technology provides the long-range and low-power capabilities in an Internet of Things (IoT) platform that is needed for operating HEX’s exit signs. With its flexibility and easy deployment, Semtech’s LoRa Technology is ideal for emergency evacuation solutions. HEX’s innovative application is a perfect example of IoT technology solving real-world challenges that create a smarter planet. Semtech’s LoRa devices and wireless radio frequency technology form a widely adopted long-range, low-power solution for IoT that gives telecom companies, IoT application makers and system integrators the feature set necessary to deploy low-cost, interoperable IoT networks, gateways, sensors, module products, and IoT services worldwide. IoT networks based on the LoRaWAN specification have been deployed in over 100 countries, and Semtech is a founding member of the LoRa Alliance, a fast-growing IoT Alliance for Low Power Wide Area Network applications. 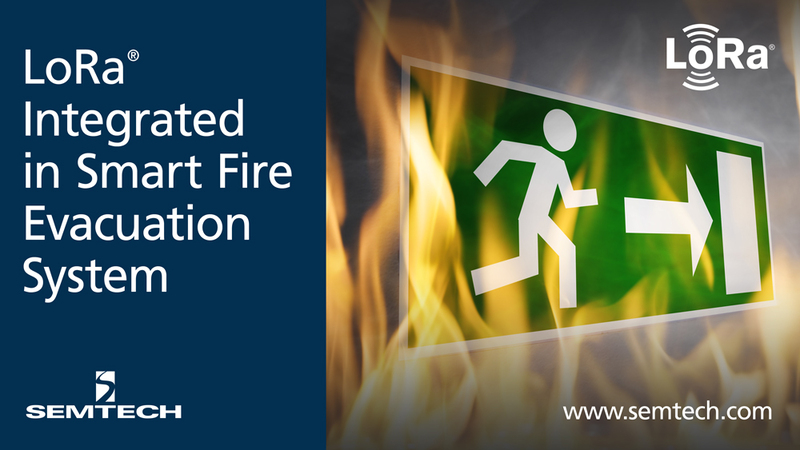 To learn more about HEX’s Dynamic Exit Signs and complete evacuation system, visit the HEX SAFETY website. To learn more about how LoRa enables IoT, visit Semtech’s LoRa site and join the LoRa Community to access free training as well as an online industry catalog showcasing the products needed to build an ideal IoT application. For wayfinding or emergency lighting lasting 10-12 hours, check out this photoluminescent paint December 28, 2018 In "Products and Services » Safety and Health"
Make your safety message stand out on these hard-wearing customizable floor mats March 13, 2019 In "Products and Services » Carpeting & Flooring » Safety and Health"
Find out how this sensor/app navigation system can give the blind and visually impaired full access to your public building November 30, 2018 In "Products and Services » Safety and Health"
Top 3 workplace safety trends from 2018, and how signage and labels can help for 2019 January 7, 2019 In "Surveys and Trends"
Looking for digital displays? Sharp’s new models in various sizes enable remote control from connected devices February 4, 2019 In "Products and Services » Electronic Communications, A/V"